'I recognize that it's a historic moment. I'm the first transgender woman to be nominated as a candidate by a major party in Canada for any level of government. That feels really good,' says Oger. Vancouver's Morgane Oger continues to break barriers. 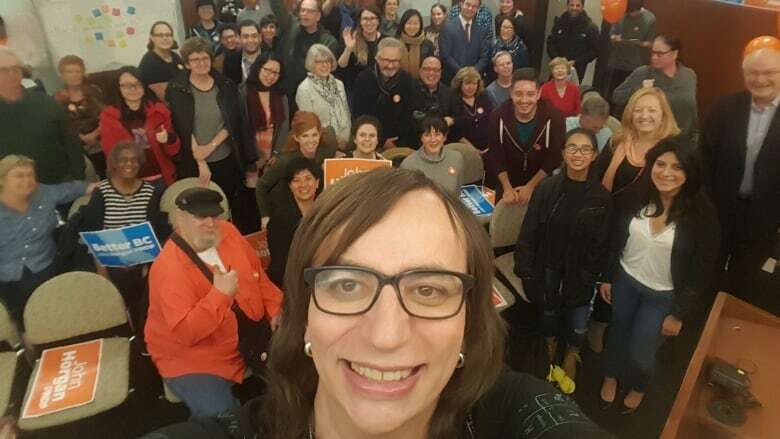 On Sunday she became the first transgender person to be nominated by a major political party as a candidate at any level of government in Canada. Earlier this year, Winnipeg transgender advocate Shandi Strong ran unsuccessfully for the Liberals in Manitoba's provincial election. Unlike the B.C. NDP, though, that party is not a major player in its province's political scene, having only won 3 seats in the latest election, and even fewer in the four previous elections. Oger will now try to win the provincial riding of Vancouver-False Creek in May, which is currently held by the B.C. Liberal's Sam Sullivan. "If I am elected I'll become the first transgender person in Canadian history to get elected to any position," she said. "I'm aware of what this means to marginalized people in Canada. I'm aware that it represents the fact that there's going to be a little bit less marginalization. I'm very aware of the systemic discrimination of all kinds of communities, not just the ones I happen to belong to." Oger is not new to political life and has been an outspoken advocate for a number of causes. A single mother of two, she has volunteered at civic, provincial and federal levels, but has never before sought public office. Oger faced some competition for the nomination from Avneet Johal, a former UBC student politician, but he later withdrew. Now Oger says it's time to focus on getting ready to win the riding in May. "Now we kick off our campaign in earnest," she said. "We have a long road ahead in Vancouver-False Creek. "The last election, you know, we were beaten by about 10 per cent, so we've decided to get started right away." Oger says she also wants to get out into the riding and meet more constituents. "I'm going to represent everybody. I understand what it's like to be marginalized and that it's a struggle," she said. "I understand that British Columbia is a province that needs to work for everybody."